I was invited to be involved in a fundraising project for La Leche League GB, organised by a lovely photographer (herself a busy mother) from the south coast who started thinking about making a calendar as a fundraiser … this has now evolved into a website with the most wonderful and diverse images all celebrating the theme of ‘Mindful Mothering’. I’m very proud to be a part of the project and look forward to the calendar coming out in due course … all in a great cause. La Leche League volunteers supported me at the start of our nursing journey and without them the last two and three quarter years would have been very different, I seriously can’t imagine how it would have been without the absolute joy of breastfeeding and all the associated stories and incidents … I think now she loves it even more than me … this morning wanting me to breastfeed a dead pigeon to bring it back to life because “milky makes it better” … she leaps upon me every time we’ve been apart, and after the happy shout of “Yay Mummy” always comes the inevitable, “milky Mummy”. 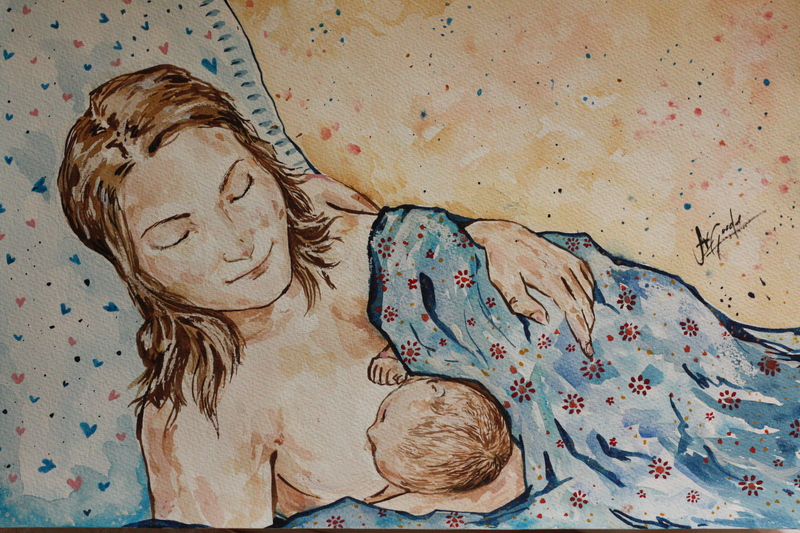 Back to the Mindful Mothering Project, I submitted some words about my experience of being a mother and breastfeeding, alongside a picture taken by our friend the very insightful photographer Paul Clarke. He came to visit back in the Spring and took some wonderful photos of Hope and I breastfeeding.